B&H has put together this ToughGaff Gaffer Kit to give you everything you'll need to get to work on set. The kit includes a nylon belt to which you can attach the provided 2" Gaffer Tape Belt Holder. The holder accepts the kit's 2" x 30-yard roll of tape and allows you to tear off a length of it with one hand. The kit also includes the handy ToughGrip, an ergonomic handle with 1/4"-20 male threads on one side and 3/8"-16 male threads on the other. Use it to handhold monitors or other gear or use one on each side of heavy equipment. 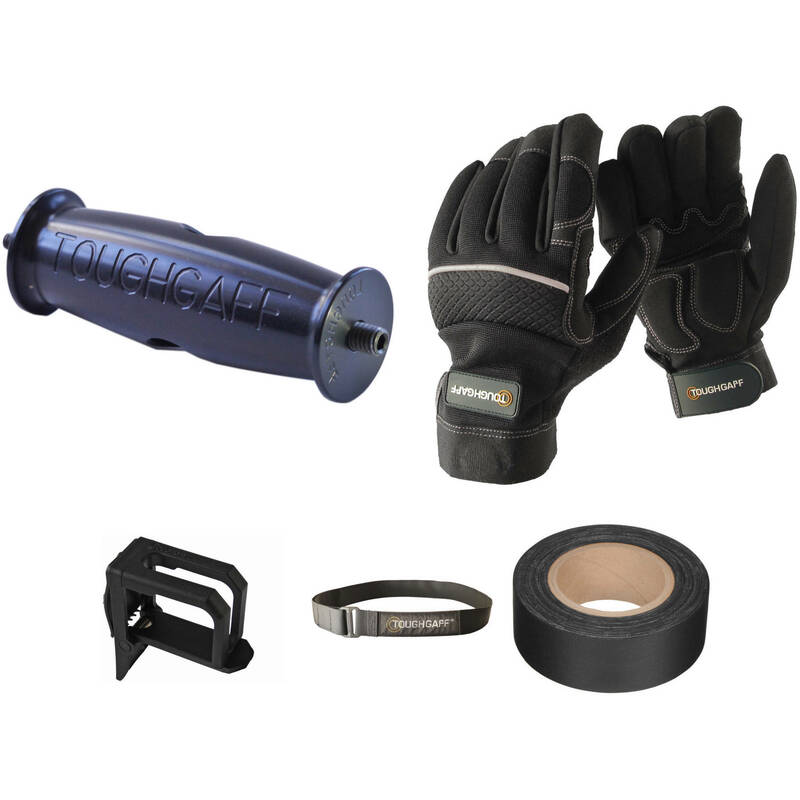 Also included is a pair of ToughGlove Magnetized Working Gloves that magnetically attach to the ToughGaff Gaffer Tape Holder. Sometimes it's the small things that give you an edge. The ToughGaff 2" Gaffer Tape Belt Holder is a case in point. Instead of fumbling and tearing at a roll of gaffer's tape at a crucial moment, you can always have it at the ready. Working much like a holster, you can tear off a length of tape with one hand while steadying or holding an object with the other. The Tough Gaff ToughGrip features a 1/4"-20 threaded hole on one end and 3/8"-16 on the other, and comes with matching screws that secure into the holes and offer mounting studs. Using the threads and/or screws the ToughGrip can be alternated between different gear. You can also have one item attached on each end at the same time, such as a monitor on top and receiver on the bottom. The ToughGrip is made of aluminum and has a raised lip on each end for more secure handling. The ToughGaff Nylon Belt is a secure and convenient solution for connecting a ToughGaff Gaffer Tape Holder to one's side. Designed for professional filmmakers and stage crew, the belt's durable, lightweight nylon material resists tugging and pulling when removing tape from an attached Gaffer Tape Holder. This allows the user to avoid putting wear and tear on a standard belt while providing a long-lasting workday solution. The Nylon Belt is 1.5" wide and fits waists measuring 31.5 to 46.5". It also includes convenient cutting marks in case the belt requires shortening for use. The extra extra large, ToughGlove Magnetized Working Gloves from ToughGaff include a pair of durable and padded work gloves that can be arranged to magnetically attach to a ToughGaff Gaffer Tape Holder or to a belt up to 2" wide. Each glove includes a removable magnet housed within a compartment that can be closed with a touch-tab fastener. Also included is a Belt Magnet Strap that has its own magnet compartment. The strap can be looped around a ToughGaff Gaffer Tape Holder or to a belt. With an included magnet, the strap provides a place to easily attach and detach the gloves at any moment. Each glove is made of durable, synthetic leather that offers moderate heat resistance. Though each glove is padded for comfort and hand protection, sensation is allowed through the palm areas so that the wearer maintains a good sense of their grip when handling an object. The included pair of large gloves fit hands measuring approximately 8.66" (22.00cm) around the palm. This roll of Black Gaffer Tape from Devek measures 2" by 30 yards and is designed with convenience in mind. Made of durable vinyl-coated cloth with a high tensile strength, this tape can be easily hand-torn and comes in a matte finish that does not gleam under light. Its high-tack adhesive coating allows it to be easily attached to most smooth surfaces, and avoids leaving a messy white residue when removed. Gaffer tape is used primarily for theater, musical venues, and film production, and is an essential tool for any professional lighting technician. Box Dimensions (LxWxH) 4.9 x 3.7 x 1.6"
Box Dimensions (LxWxH) 6.0 x 1.9 x 1.4"
Box Dimensions (LxWxH) 7.5 x 1.6 x 1.1"
Box Dimensions (LxWxH) 9.5 x 4.7 x 1.3"